The FlukePack30 industrial-grade backpack for the professional is built with durable high-quality polyester & features over 30 heavy-duty pockets for storing & carrying your tools to the next job. The FlukePack30 industrial-grade backpack for the professional is built with durable high-quality polyester and features over 30 heavy-duty pockets for storing and carrying your tools to the next job. Six storage sections for test tools, hand tools, a laptop or table, and other small items. Rugged waterproof molded bottom offers protection from the elements and keeps the backpack standing for convenient access to tools. EVA covers on the front and top of the backpack for added protection. The backpack is padded on the back for compfort and lumbar support. Adjustable chest strap for ergonomic attachment and even weight distribution. What you need. Where you need it! The backpack offers padding in the back for comfort and lumbar support. Adjustable chest strap for better weight distribution and increased comfort. Backpacks offer a convenient method for organising, storing and your carrying tools. Keeping all the tools you need in a single Fluke Pack30 means fewer trips back to the truck. Plus, the Fluke Pack30 gives you a more comfortable solution than traditional tool belts that put all the weight on your lower back, or tool bags with awkward carrying straps. 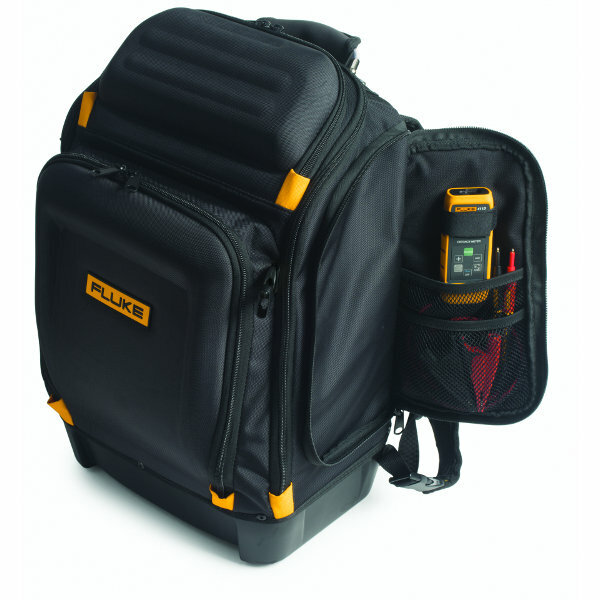 The Fluke Pack30 is a great solution for the electrician on the go!